Mad Mexicans will be playing with Ice-T & Body Count! 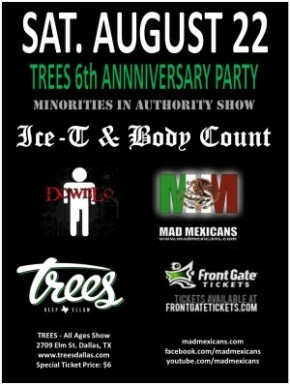 Come celebrate Trees’ 6th Anniversary with Ice-T & Body Count, Downlo, & Mad Mexicans. Ticket price is $6. Show will sell out! For tickets visit: www.treesdallas.com. See ya at the show!! !